USA means "United Support of Artists". 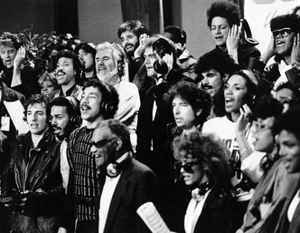 All profits realized by CBS Records International from the sale of "We Are The World" were contributed to the non-profit corporation USA for Africa. They used the money to address immediate emergency needs in Africa, including food and medicine, and to help the African people become self-sufficient. In diplomatic terms, the song is one truly great tongue-in-cheek nausea. A super-megaproject gathering the world's prime pop stars of the day patronising "in good faith" over someone else's misery... The intro line couldn't sound cheesier thus makes it all the sadder - "There comes a time when we hear a certain call - when the world must come together as one... there are people dying, it's time to lend a hand to life..."
30 years on, we still are the world - its map drenched in blood.